The reason for my "loud" typing above follows........ as I drove back onto the I-70 and started heading east, the large raindrops began to look icy as they hit my windshield. As I passed the last exit to Vail, the icy raindrops began to be accompanied on their descent by white flakes. And another 10 minutes along the road, the rain stopped completely and was replaced by large white snow flakes that were sticking to everything! 15-20 minutes after I had gotten into my car, I was in the middle of a snowstorm on the I-70 with no way of exiting for another 30 kms. Alright, I thought, I can handle this. And I could - for the next 10 minutes. After that, my nerves started to become frayed as the snow began piling up on my windscreen and my back window was covered and I could not see the road for the flurries of snow or the side of the road either!! I managed to catch up to a large truck and sat about 3m behind it going about 30-40 km/h. I locked my eyes onto the taillights and did not look up basically! I lost that truck as it sped u pat one point and I was on my own - that was interesting, slipping and sliding in the snow. I think I almost got the median rail in the middle of the road too at one stage! Got very close anyway I think :-/ I caught up to three cars travelling in a line though and again sat behind them and just followed them wherever they went on the 'road' - very glad they were able to find the road myself! Through this I managed to click my iPad on, drop a pin on the next town and begin the countdown until I could turn off......20 km......15 km........10 km.......8 km.......6 km.......5 km........4 km.......3 km........1km..........Yes!!! Hello Frisco :-) I turned off into the lovely town of Frisco with about a 45 square centimetre cleared space on my windscreen (in front of me thankfully) and a pile of snow on the side where the wipers had cleared it to sitting 15 cm high. Hotel Frisco was kind enough to have a room for me and I crashed out on adrenaline overload at 8:30pm. Eeeck! An adventure I do not want to repeat any time soon - and this was a fairly tame one to what it could have been!!! Following this scenic visit, Leanne and I headed for Golden for lunch. Golden is a cute little cowboy town about 10 minutes from Denver that is a bit tricky to find sometimes on the freeway - may have also just been my driving too! Cute cowboy and cowgirl statue!! 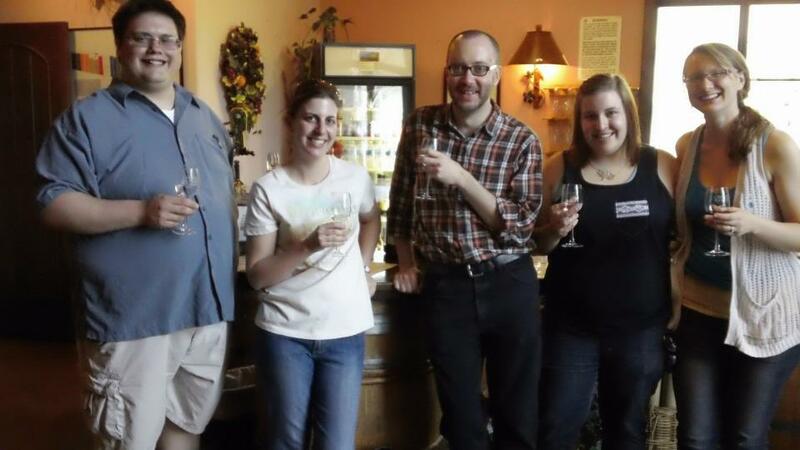 A group of friends and I headed out to explore some of Palisade's amazing wineries. We even did it responsibly (as we always do and should - in case there is any students reading this blog still)! We all met at my place and then walked about a block to the first two wineries which were the Meadery of the Rockies (favourite!!) and Plum Creek Cellars. We then walked towards the I-70 and tasted at St Kathryn Cellars (another favourite), Grande River Vineyards and even another one we found as we were walking through town to the Brewery and Distillery! (forgot the name of that one). It was a really fun and great way to spend a Sunday afternoon with mates. We will be doing that again hopefully!! Palisade held its first festival on the weekend - the Honeybee festival which was, perhaps obviously, themed around bees!! Some interesting activities, a lot of handmade honey and soaps and even a talk by a bee keeper! A good way to check out downtown and get to know what was there as well. Enjoy heading back into Term 2 fellow teacher friends, students and family. Everyone else - hope this finds you all well! Keep smiling and stay safe wherever this year takes you. Back soon with more adventures! Enjoying your blog Candice..sorry we didn't get the chance to catch up at the basketball. Hi Candice - You are certainly having an action packed year and obviously enjoying every minute of it! Although your drive of a lifetime to the safety of Frisco must have been an unwanted thrill!! I was feeling quite sick reading it! I am so glad that you arrived safely and now that the weather is warmer, hopefully you won't encounter the same experience again! I have been in Tasmania and was at Cradle Mountain waiting for the shuttle bus to come when I struck up a conversation with a young American traveller. She was telling me how she had to keep telling herself to keep to the left when driving, but was becoming more confident. So I told her about your driving experience and she could really empathise with your experience! She said it was really dangerous to be stuck driving in those conditions and that sometimes they closed the highways, so then all of the gas stations closed and anyone driving had no where to stop! She was from Missourri - not sure how you spell it - which is a couple of states across from where you are. Anyway, the way she spoke chilled me to the bone and I had to keep reminding myself that you had arrived safely and that your nightmare drive was now well in the past! Not long now till your long holidays, which you must surely be hanging out for! Do you have to write reports first, and is the reporting process there as cumbersome and time consuming as ours?????? Hope not! Love Judy. Full marks for the quality of the writing in this blog! I was very tense as I was reading about your car journey in the snow storm - a credit to your writing. And, I was very relieved that you found Frisco. You be careful now, and continue having a wonderfully adventurous time.